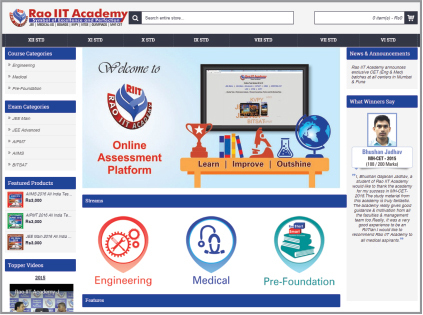 Rao IIT Academy - RAO Educonnect Distance/E-learning Division Program for JEE Main, IIT-JEE Advanced | NEET-UG | AIIMS | NTSE | Class VI to X. There is finally a hope, for those aspiring quality education and performing better in competitive exams, but living a fair distance away from Rao IIT Academy study centres. 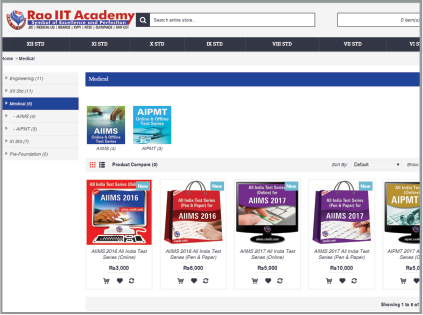 You now can log onto our new E-commerce portal raoeduconnect.com and avail our vast range of E-Learning, Test series and other online and offline courses for Std 6th to 12th. 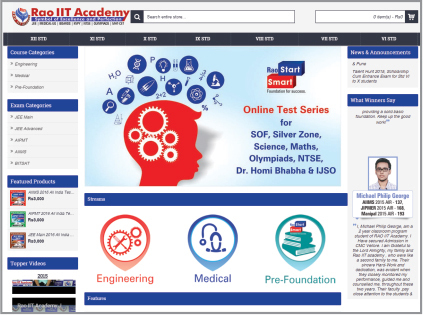 The newly introduced "Learn and Test" courses comprise of topic-wise booklets with solutions and 600+ hours of lecture videos created by our highly renowned and experienced faculty allowing you to access topic-wise tests of easy, medium and tough difficulty levels followed by part tests and major tests to strengthen the fundamental concepts. And finally, expert analysis and evaluation of your test performance along with recommended study material to strengthen the weak areas further sharpen those rough edges. Empower yourselves through Rao Educonnect, India's fastest evolving online education portal.